Successfully Added Quadband Cellphone Wrist Watch in Onyx Color with Leather Straps to your Shopping Cart. This onyx colored quadband cellphone wrist watch comes with a leather strap and an adjustable butterfly clasp design for maximum comfort. This simple and yet powerful mobile phone watch caters to your communication and music needs exceptionally, with an abundant array of onboard communication and multimedia features. The M51 watchphone supports the four global standard GSM frequencies (850MHz, 900MHz, 1800MHz, 1900MHz), so you can be confident that it will work anywhere around the world. This cell phone watch comes fully unlocked, meaning you can use it with the network of your choice. And then let's not forget, this is still a fully functioning digital watch with time, date and day display with programmable alarms and to do lists for keeping you on schedule and in style. How easy is it to use? Just like a any cellphone, you can use the built-in microphone and on board speaker to make and receive calls, or you can use the included wireless Bluetooth headset for maximum user convenience. The watch phone has a touch screen interface with touch sensitive menus and icons to help make navigating through this mobile phone watch's variety of features fast and efficient. 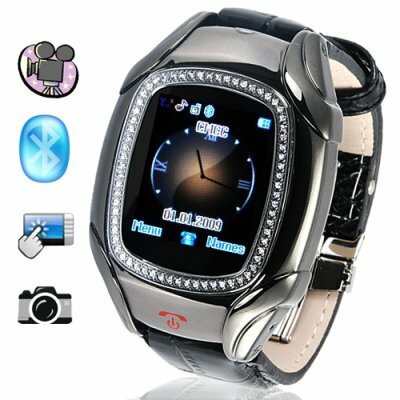 What else can this mobilephone digital watch do? Well, the M51 watchphone also comes with onboard photo and video camera, micro SD card slot with a 1GB card included, Music and Video players, and two high capacity lithium-ion rechargeable batteries. This watchphone is really a complete communication tool that is not only smart and convenient, but is also instantly ready for use as soon as you open the box. This unique designed combo cellphone and digital watch is available for single piece and bulk OEM purchases. Get yours today and an incredible factory direct wholesale price from the leaders in wholesale electronics, Chinavasion. The microSD card sits beneath to the SIM card both of which are accessible by removing the watch battery. Is the CVSL-M51-Onyx watchphone waterproof? No. The phone is weatherproof, meaning you can wear it when it is snowing or raining, but it can not be submersed in water or kept under constant water pressure. Photos and Graphic By: R.W.